Learn practical dementia care techniques on your own schedule, at your own pace. Each class can be completed within 5-15 minutes. 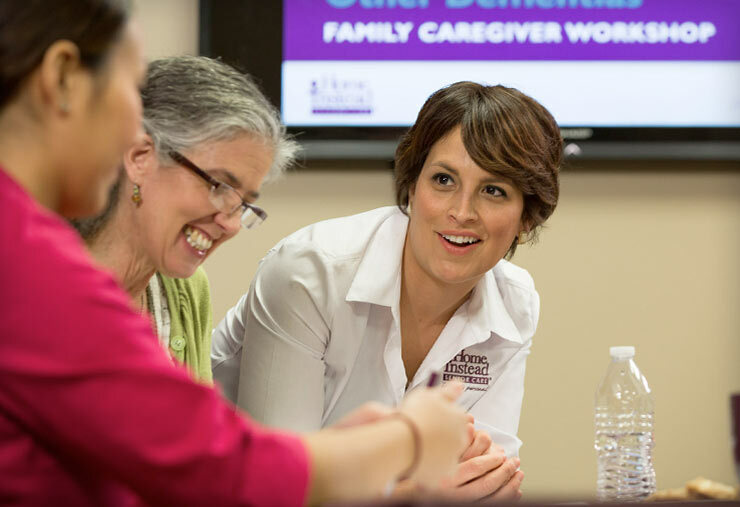 Professional caregiver trainers at Home Instead Senior Care franchise offices across the nation will lead workshops for family caregivers on four different topics related to Alzheimer’s disease and dementia care. Workshops can be taken in any order. For instance, you do not need to take one class to get the full meaning of another. Workshop content may vary by location. Gaining a better overall understanding of Alzheimer’s disease and other dementias, and knowing what to expect as the disease progresses, can help you and your loved ones better face the challenges that come with memory loss. Learn about the causes of Alzheimer’s disease and other dementias. Recognize the signs and stages of Alzheimer’s disease and other dementias. Discover how Alzheimer’s disease and other dementias are diagnosed. Understand more about the behavioral symptoms that can be caused by Alzheimer’s disease and other dementias. Search for workshops near you at the top of this page. Someone with Alzheimer’s disease will likely experience problems with cognitive processes, such as thinking, attention span, perception, learning, memory, reasoning, problem solving, decision making, and planning. Learn techniques for responding to cognitive symptoms. Understand the importance of their life story when responding to cognitive symptoms. Track the progression of cognitive symptoms. One aspect that can cause stress and uncertainty when caring for a loved one with Alzheimer’s disease or other dementias is safely and effectively minimizing behavioral symptoms of the disease. Learn more about the behavioral symptoms that may be displayed by those with Alzheimer’s or other dementias. Discover techniques to help cope with these symptoms. Determine what techniques work best to minimize different behavioral symptoms. Activities that maximize the abilities and independence for an individual with Alzheimer’s disease or other dementias remain one of the best ways to help a person remain active and live a meaningful life. Learn about the benefits of staying active for a person with Alzheimer’s disease or other dementia. Learn about three types of activities – for mind, body, and soul. Discover various techniques to encourage your loved one to engage in an activity. Become familiar with activities that are suitable for late stage Alzheimer’s disease or other dementia, to stimulate your loved one’s five senses. Individuals with Alzheimer’s disease or other forms of dementia become increasingly unable to take care of themselves. Physical challenges can also develop. By being aware and taking ongoing preventative action, you can reduce the likelihood of accidents and injuries. Identify potentially hazardous situations around the home. Learn about techniques to prevent unsafe situations.